Adored, Age of Aquarius, Aigue Marine, Aloof, Alvaro, Apple Betty, Astrology, Be My Gal, Beacon Rock, Beautiful Morning, Best in the World, Bondi Beach, Broadway, Bye Bye Baby, Cabaret, Coolmore, Cyprus Creek, Cuis Ghaire, Douglas Macarthur, Dress Rehearsal, Ernest Hemingway, Eye of the Storm, Faufiler, Feel Like Dancing, Fields of Athenry, Flattering, Flying the Flag, Galatee, Galileo's Choice, Gatewood, Gravitation, Giuseppe Pazzi, Heliostatic, Hermosa, Housesofparliament, Igraine, John F Kennedy, Kenya, Kissed by Angels, Lay Time, Leo's Starlet, Lightinthenite, Lil'wing, Magical Dream, Mahler, Mekong River, Midterm, Mizzou, Observational, Oh Goodness Me, Orchestra, Pretty Perfect, Prima Luce, Promise to Be True, Quest for Peace, Rain Gal, Rain Goddess, Recorder, Saint Minerva, Say, Scintillula, Sense of Purpose, Sevenna, Shantaram, Sidera, Silver Galaxy, Sir Isaac Newton, Sizzling, South Easter, Spanish Steps, Starstruck, Sub Rose, Terrakova, The Corsican, The Pentagon, Ursa Major, Us Army Ranger, Venice Beach, Wonderfully. Ampere, Antony Van Dyck, Battle of Marengo, Call To Mind, Cliffs Of Moher, David Livingston, Elizabeth Browning, Gallant Tess, Global View, Gospel Choir, Gretchen, Gustav Klimt, Idaho, Il Saggiatore, Incanto Dream, Japan, Johann Zoffany, Kite Wood, Magic Wand, Midas Touch, Mikhail Glinka, Mission Impassible, Mohawk, Platinum Warrior, Port Douglas, Secret Gesture, Sertorius, Spiritjim, Sword Fighter, Tanby, Telescope, The Taj Mahal, Up, Vendangeur, Wedding Vow, Yucatan. Frankel 10, Minding 7, Highland Reel 7, Cape Blanco 5, New Approach 5, Misty for Me 4 ,Igugu 4, Gleneagles 4, Churchill 4, Winter 4, Rip Van Winkle 3, Lush Lashes 3, Noble Mission 3, Australia 3, Golden Lilac 3, Found 3, Alice Springs 3, Order of St George 3, Decorated Knight 3, Rhododendron 3, Red Rocks 2, Treasure Beach 2, Soldier of Fortune 2, Teofilo 2, Roderick O'Connor 2, Alandi 2, Magician 2, Adelaide 2, Nathaniel 2, The Gurkha 2, Mondialiste 2, Seventh Heaven 2, Photo Call 2, Ulysses 2, Capri 2, Happily 2. 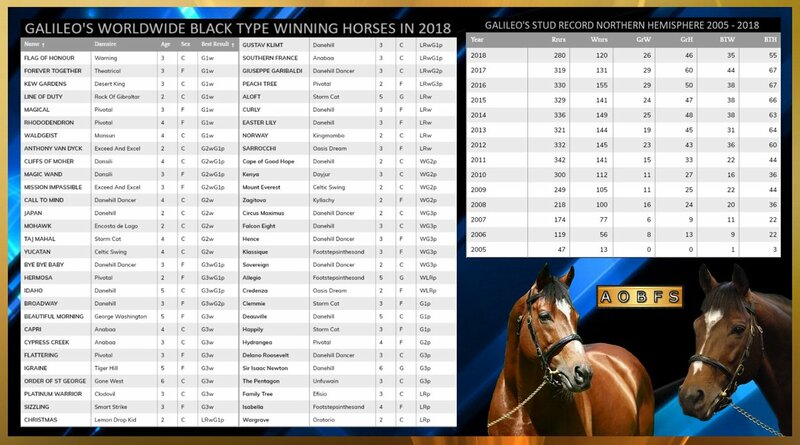 Hyrangea 2, Waldgeist 2, Kew Gardens 2, Kingsbarns 1, Imperial Monarch 1, Was 1, Great Heavens 1, Together 1, Galikova 1, Lily of the Valley 1 ,Sans Frontieres 1, Cima De Triomphe 1, Nightime 1, Maybe 1, Sixties Icon 1, Allegretto 1, Mahbooba 1, Niwot 1, Sousa 1, Ruler of the World 1, Intello 1, Linton 1, Romantica 1, Seville 1, Altano 1, Marvellous 1, Tapestry 1, Together Forever 1, Ballydoyle 1, Curvy 1, Johannes Vermeer 1, The United States 1, Deauville 1, Foundry 1, Clemmie 1, Forever Together 1, Flag Of Honour 1, Magical 1, Line Of Duty 1. Frankel 10, Minding 7, Highland Reel 7, Cape Blanco 5, New Approach 5, Misty for Me 4 ,Igugu 4, Gleneagles 4, Churchill 4, Winter 4, Rip Van Winkle 3, Lush Lashes 3, Noble Mission 3, Australia 3, Golden Lilac 3, Found 3, Alice Springs 3, Order of St George 3, Decorated Knight 3, Red Rocks 2, Treasure Beach 2, Soldier of Fortune 2, Teofilo 2, Roderick O'Connor 2, Alandi 2, Magician 2, Adelaide 2, Nathaniel 2, The Gurkha 2, Mondialiste 2, Seventh Heaven 2, Photo Call 2, Ulysses 2, Capri 2, Rhododendron 2, Hyrangea 2, Happily 2,, Waldgeist 2, Kew Gardens 2. Golden Lilac, Australia, Gleneagles, Minding, Churchill, Winter, Order Of St George, Capri. Frankel - £2,998,302 - A 10 time Group One winner in England. Ruler Of The World - £1,070,243 - A Group 1 winner in England and a Group 2 winner in France. 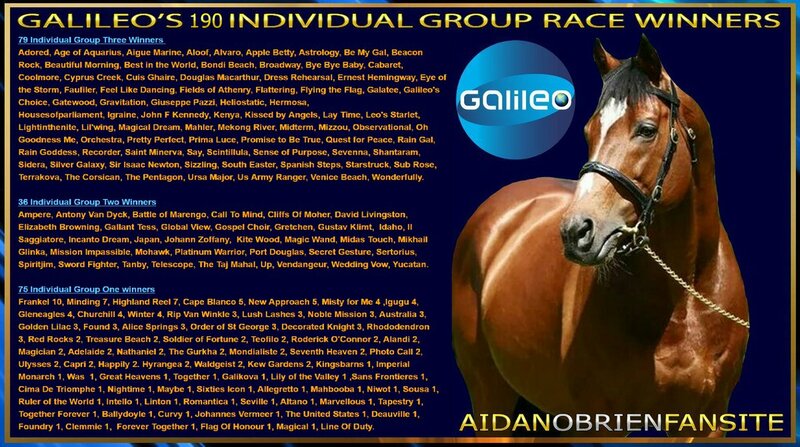 Galileo Group One progeny Vctories by Nation. Cheveley Park Stakes -(1)- Clemmie (2017). Highland Reel - Secretariat Stakes, Hong Kong Vase, King George VI and Queen Elizabeth Stakes, Breeders' Cup Turf, Coronation Stakes, Prince of Wales Stakes, Hong Kong Vase. 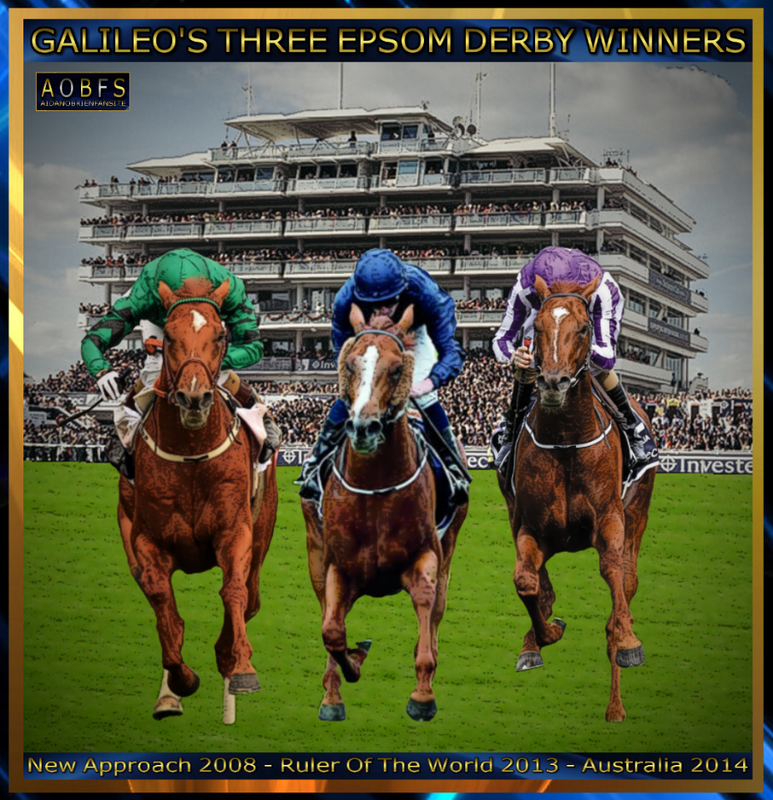 Churchill - National Stakes, Dewhurst Stakes, 2000 Guineas, Irish 2000 Guineas. Hydrangea - Matron Stakes, Champion Fillies & Mares Stakes. Rhododendron - Fillies' Mile, Prix L'Opera, Lockinge Stakes. Winter - 1000 Guineas, Irish 1000 Guineas, Coronation Stakes, Nassau Stakes. Clemmie - Cheveley Park Stakes. Cima De Triomphe ,Frankel, Heliostatic, Intello, Nathaniel, New Approach, Rip Van Winkle, Roderic O’Connor, Ruler Of The World, Sixties Icon, Soldier Of Fortune, Teofilo, Treasure Beach, & Yazamaan.